If I close my eyes and think back, I can almost smell it. Fresh mint drying on a tray in Mama’s kitchen. It’s a comforting childhood memory and every time I get a whiff of fresh mint it’s like going home again. As we walked through the market on Saturday we passed a stand with the freshest most amazing looking herbs. My eyes met a bunch of fresh mint. It was love at first sight. We brought the mint home and the smell filled the air in our tiny Milanese apartment. 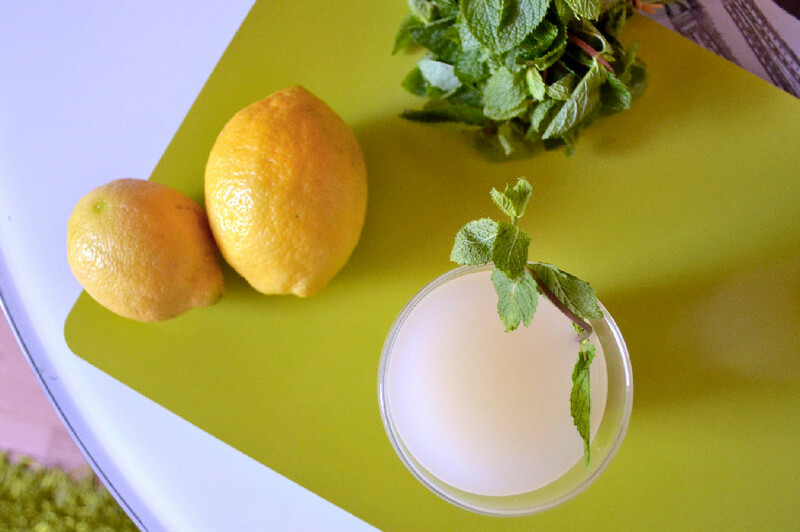 Mint is a staple in a Lebanese kitchen. It is used fresh dried on salads like fatoush, tabbouleh, or salatet malfouf, eaten fresh or fresh dried with labneh or za’atar rolled up in pita bread, added to stuffed zucchini or cabbage rolls or served fresh at the table to nibble on with every bite. 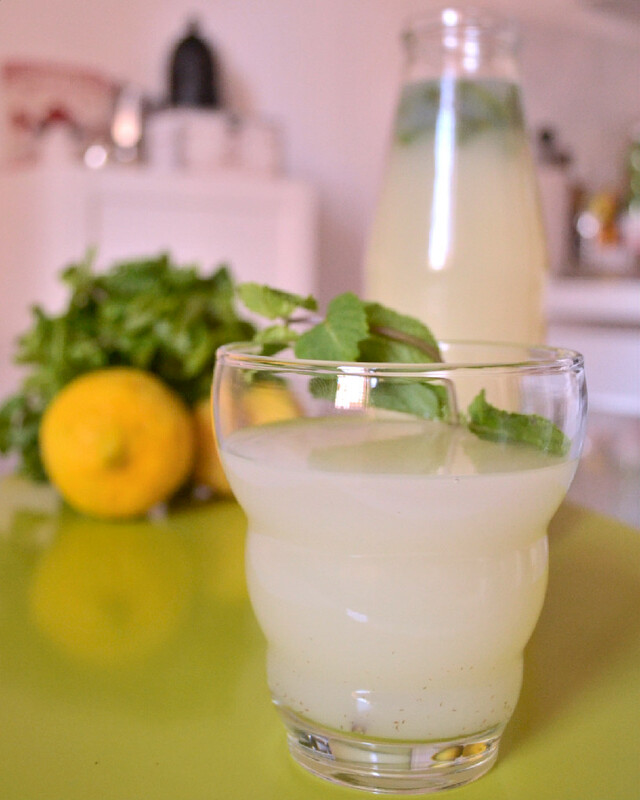 Mama even used to make us fresh homemade mint lemonade when we were children, as her Mama used to do back in Lebanon. 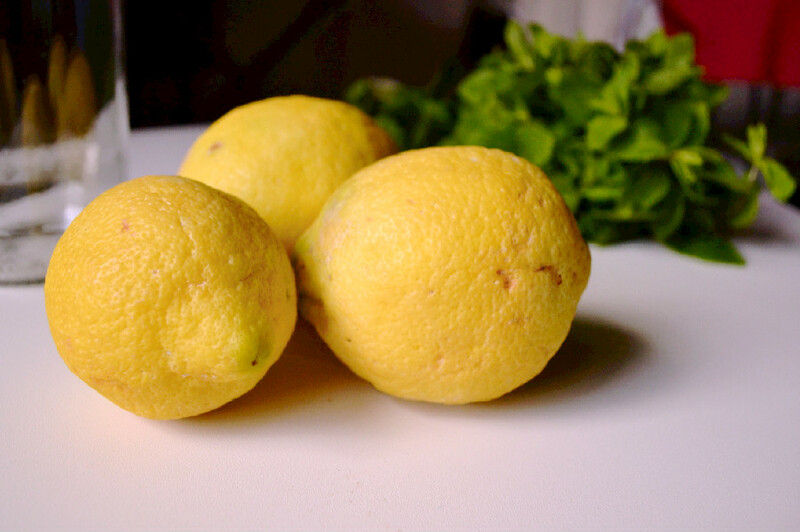 The process began with macerating the lemons in copious amounts of white sugar, then squeezing out the juice by hand, gradually adding water and finally fresh mint from the garden. Freshness in a glass. Since I cut out refined sugar over a year ago, I wanted to adapt this childhood favourite using brown rice syrup* instead. I made a Mint-Infused Simple Syrup and had to play around with the ratio of brown rice syrup to water quite a but, but finally got the sweetness just right. The result is a nice balanced lemonade. Not too sour. Not overly sweet. Refreshing with just the right hint of mint and perfect for a summer day. Hubby say its like a non-alcoholic Mojito, but with lemons instead of limes. What ingredients remind you of childhood? Share in the comments. 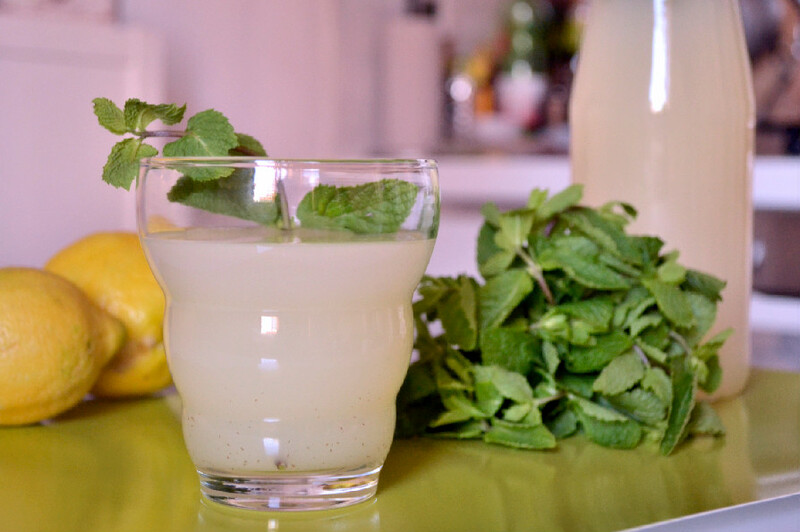 This refined sugar-free Mint Lemonade is the perfect refreshing drink for a warm summer day and even doubles as a cocktail mix. 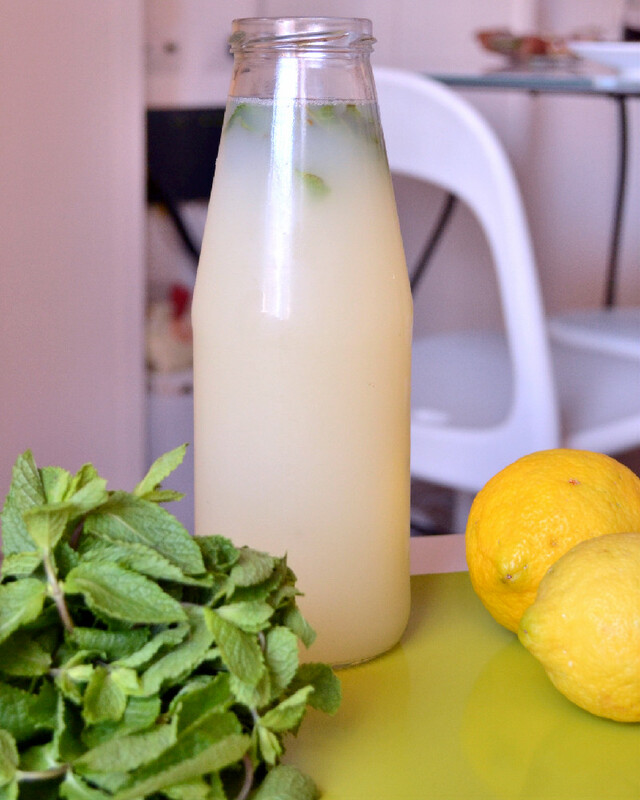 Combine water, lemon juice and 1/4 cup of fresh mint leaves in a jug or bottle and set aside. Meanwhile, prepare the mint syrup by combining all ingredients in a pot over medium heat. Simmer until brown rice syrup has melted completely and liquified. Remove from heat and let steep for about 10 minutes, until the mint has infused the syrup. Strain out the wilted mint. Add mint syrup to the lemon/water/mint mixture and stir well. 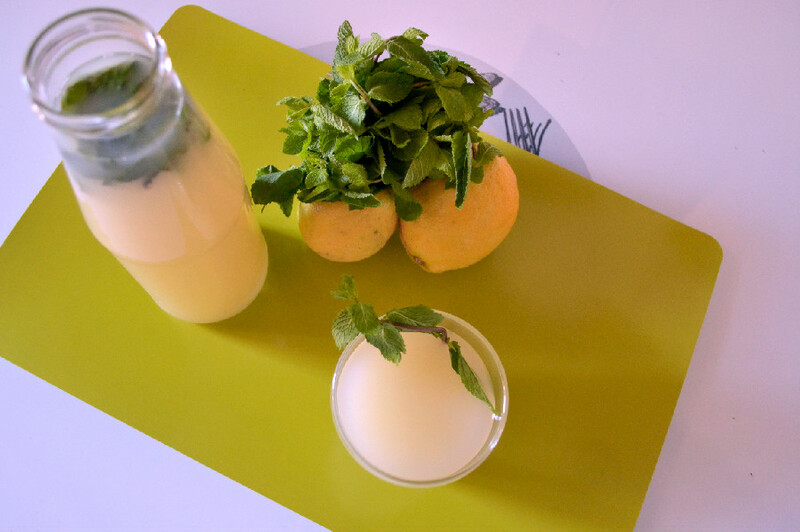 Refrigerate to chill and strain out the remaining fresh mint as you pour it out into the glass. Serve chilled, with a sprig of fresh mint. For a “Mojito” like cocktail, add white rum and club soda, to your liking, and enjoy. Note: Feel free to play around with the brown rice syrup to water ratio to get the sweetness you’re looking for. *Grain syrups and malts add a subtle sweetness without overpowering the main flavours. They are mostly made up of soluble complex carbohydrates, maltose and water, are digested over a prolonged period of time, and provide a soothing and calming effect on the body. They are made from slowly breaking down the grains and since they contain only trace amounts of glucose, they don’t cause alterations in blood sugar levels and the infamous sugar highs and lows.